We invite you to participate as a sponsor or exhibitor at the 5th annual UX Burlington. This yearly gathering provides a forum for digital experience leadership and brings together more than 200 top thinkers from private, public, education, and non-profit organizations. UX Burlington brings together the area’s digital community by providing continued learning and great networking for talented professionals from the C-suite and VP level to directors, managers, and project team members. 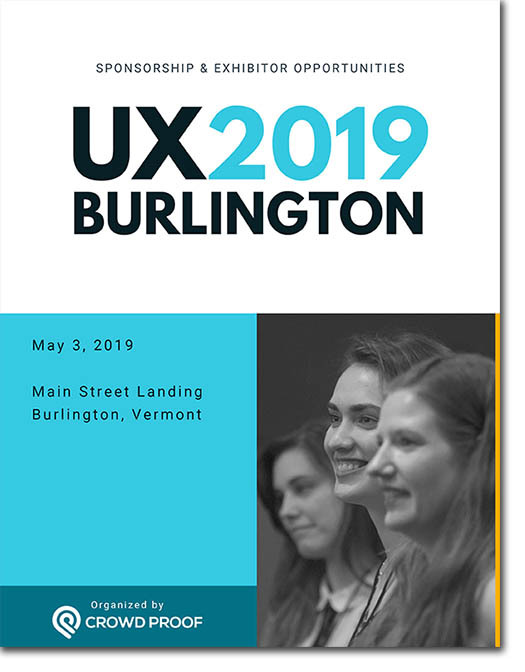 UX Burlington affirms Vermont’s influence on digital innovation and pushes area organizations and individuals to not only keep up with rapid marketplace evolution, but to place Vermont at the forefront of digital customer experience. Reserve one or multiple sponsorships today. Download the Sponsorship & Exhibitor Opportunities PDF below for details.